White or yellow crusts are often technically referred to as ‘efflorescence’, which simply means mineral carried by water. This indicates that water is getting under the tiles, generally through a crack in the tile, grout, or silicon. 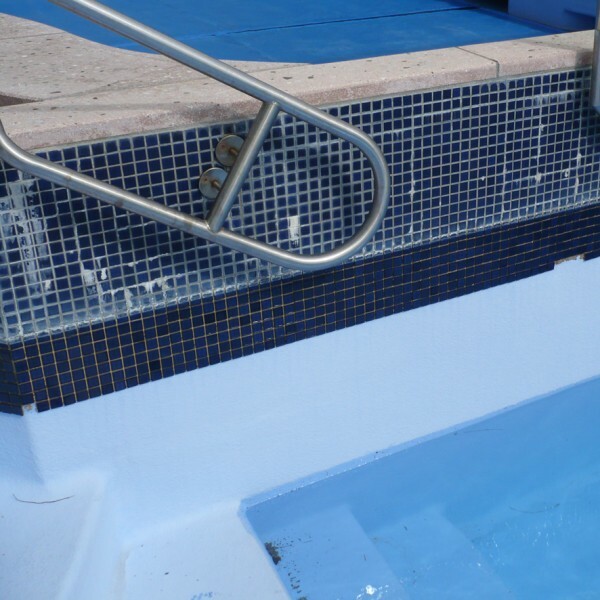 It is also possible if the area has not been waterproofed underneath that the moisture is coming from behind the installation, which is harder to resolve. When under the tiles the water picks up this efflorescence mineral, which can come from the screed, concrete, or sometimes even the grout or glue. As the water returns to the surface it carries the mineral with it, leaving the mineral on the surface of the tile or grout when the water precipitates away. The process is very similar to the creation of a stalagmite as it grows slowly over time. In New Zealand conditions where we have wet / dry cycles through the whole year efflorescence is a very common problem. While the efflorescence can physically be removed from the surface of the tile or grout, unless the core issue is resolved the efflorescence will continue to form. 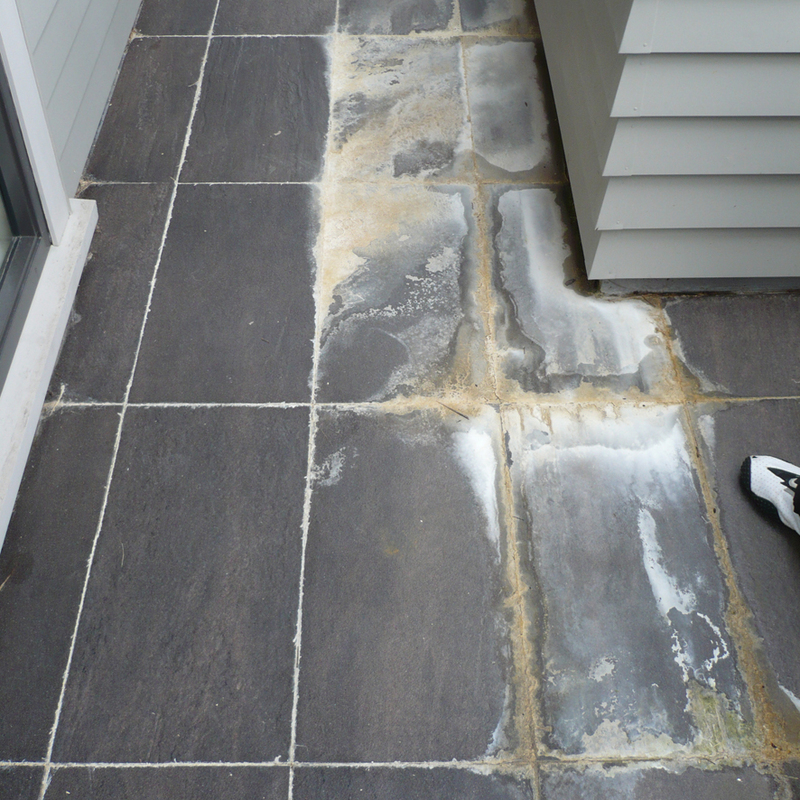 To stop efflorescence on new builds we suggest that a double waterproofing method is used. The installation is waterproofed as normal, then screeded, with another layer of waterproofing over the screed. This locks away the most common cause of the salt so that even if water does get behind the tiles and grout there is no mineral for it to pick up. 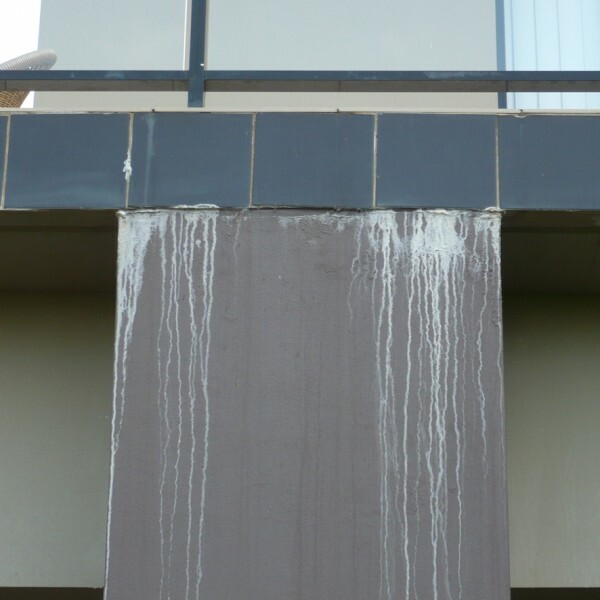 A few of the major glue and grout companies are now promoting zero efflorescence in their materials, so if these are used there should not be any efflorescence in the installation. In existing installations the best method of prevention is to try to stop water from getting behind the tiles. Fixing cracks and obvious points of entry can stop the problem. Where there has been a lot of movement and grout would likely crack in the future a special sealer can be applied which prevents water penetration through hairline cracks. You can read more about this in our article on top-down waterproofing.